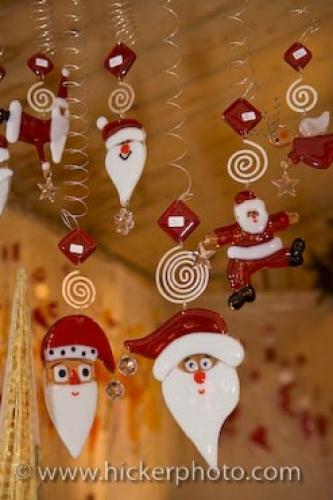 An array of Santa themed Christmas ornaments hanging down from springs or strings are on display at the christmas markets at the Hexenagger Castle in Bavaria, Germany. Red and white are the dominate colours for Santa Claus and these cute hanging ornaments at the Christmas markets at the Hexenagger Castle are the perfect impression of Saint Nic. Christmas markets in some places in Europe begin at the start of the advent period leading up to Christmas. There are many attractions at the markets including delectable food, shopping for gifts or home decorations such as these hanging Santa ornaments, or just to see the colourful characters who dress up to bring the story of christmas to life. Hanging ornaments for sale at the Christmas Markets at the Hexenagger Castle, Hexenagger, Bavaria, Germany, Europe. which are varying impressions of Santa.